REVIVAL of Nile Basin talks, Muhimbili National Hospital's (MNH) improved capacity and investments in pharmaceuticals are key issues that President John Magufuli and his Egyptian counterpart Abdel Al-Sisi discussed yesterday. Egypt has over time maintained that it has absolute rights and control over the Nile water, the claim that other members of the Nile Basin--Uganda, Kenya, Tanzania, Burundi, Rwanda, South Sudan, Ethiopia and Sudan, have strongly rejected. The Uganda held talks mid this year failed to reach a consensus after Cairo refused to sign a cooperative framework agreement (CFA) to regulate the use of the Nile water in all 10 countries. One of the CFA clauses that Cairo rejected is the one addressing the fair use and distribution of Nile water, failing to recognise Egypt's historical annual quota of 55.5 billion cubic metres of water from the Nile River, amounting to 55.5 billion cubic meters of water. And, according to the 1959 Nile Waters Agreement, Sudan claims 18.5 billion cubic meters from the Nile's water. At a joint press conference at the State House in Dar es Salaam yesterday, President Magufuli affirmed the government's readiness to revive the talks to find the best way for all member states to benefit from the Nile. "We talked about River Nile and engagement of other countries in a win-win situation... we have agreed to revive the talks. For Egypt, River Nile is their lifeline. We understand it and we are ready to revive the talks," he explained, noting however that they had not reached an accord. Cairo is also concerned that the Grand Ethiopian Renaissance Dam (GERD), the country's flagship energy project will have adverse impacts on Egypt's downstream hydropower stations and irrigation systems. President Magufuli also revealed Egypt's willingness to increase support to the health sector, to particularly enable MNH to start performing kidney surgeries before 2020. President Al-Sisi whose nation has also been assisting MNH and Zanzibar with experts and medical supplies, pledged to sustain the assistance. He promised to dispatch experts and investors to set up the pharmaceutical factory to manufacture high quality drugs at affordable prices, with the aim of reducing the government spending in imported drugs and other medical supplies. Currently, the government spends 252bn/- annually to procure drugs and medical supplies. The domestic manufacture of the medics will greatly reduce the amount. "Egypt is among countries that manufacture high quality medicines at affordable prices. Through the pharmaceutical industry, Egypt will generate foreign currencies and we will benefit from affordable drugs, employment and revenues," Dr Magufuli explained. The two countries have also agreed to increase trade, with Egypt expressing interest to construct a meat processing factory in the country for slaughtering, packaging and shipping meat to Egypt and other export markets. "Egypt is currently importing meat from India, which is further than it's from here. This factory will create jobs, government revenues and market for our livestock keepers," president Magufuli explained. Other deliberated areas of cooperation include agriculture, education, security, war against graft and tourism. Egypt Air and Air Tanzania are set to cooperate to boost tourism in the country. "Your visit has cemented the good relations existing between our two nations since the era of our founders Mwalimu Nyerere and President Gamal Abdel Nasser Hussein. I have also noted the good work done by Egyptian consulting engineers of the Nyerere Bridge -Kigamboni," Dr Magufuli noted, calling on the two countries joint commission which last met 20 years ago to meet soon. The visiting President Al- Sisi reiterated his government's commitment to work with Tanzania in major water projects, irrigation and health sector. 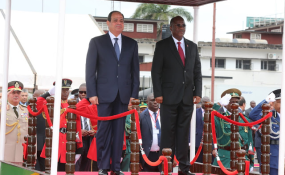 "I thank my brother, Dr Magufuli for the cordial welcome and our agreements to enhance bilateral cooperation and working to ensure our economic is inclusive," Al-Sisi stressed, commending his host for his resilient efforts in fighting graft.